Headed to a hoppin' salad bar for lunch? Chances are there will be handfuls of fresh greens up for grabs, from romaine and iceberg to spinach and red leaf lettuce. 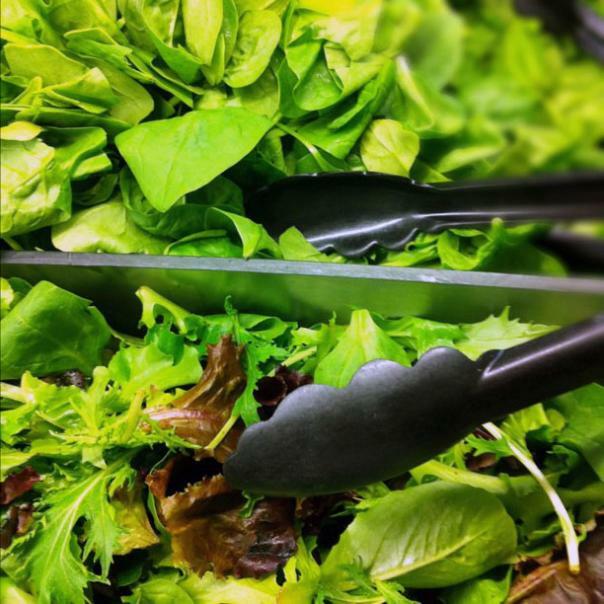 But when it comes to choosing the healthiest salad base, which types of lettuce pack the biggest nutritional punch? Sorry sandwich lovers, but a few shreds of lettuce on a bun won't add up to the USDA's daily recommended intake (2-3 cups for most adults). Instead, a big, healthy salad is one of the smartest ways to go green. Coming in at under 10 calories per cup, a big bowl of leaves can be a stellar source of vitamins A, C, K, and folate, among other essential nutrients. But not all leafy greens will build a super-nutritious salad. In fact, America's favorite lettuce, iceberg, ranks the lowest in nutritional value across the board (96 percent water content will do that!). Turbo-charged spinach, on the other hand, boasts nearly twice the recommended daily value of vitamin K, half the recommended value of vitamin A, and ample amounts of calcium and iron. Clearly, Popeye was on to something. Prefer a crunchier base? A cup of romaine is a tasty alternative, with a huge dose of vitamin A and a variety of other nutrients. Or, for a mild but textured bed, red leaf lettuce clocks in at just 4 calories per cup, with nearly half of the daily recommended dose of vitamins A and K. Arugula (technically a cruciferous vegetable like broccoli, kale, and cabbage) also packs a healthy dose of nutrients and phytochemicals, which may inhibit the development of certain cancers. And for the non-committal types, mixed greens (typically a mix of romaine, oak leaf lettuce, arugula, frisée, and radicchio) offer, well, a mixed bag of nutritional benefits, depending on the batch. Which greens are the best bet? Check out the infographic below for the nutritional low-down. Consider visiting the salad bar a free pass to join the dark side. Research shows that darker "loose" or "open leaf" lettuces (such as romaine, red leaf, and butterhead) contain more antioxidants and nutrients than the typically lighter-colored, more tightly-packed heads (such as iceberg). The reason? The darker leaves are able to absorb more light and, in turn, synthesize more vitamins. And while there's no good way to pick and choose a store-bought salad leaf for leaf, at home, opting for the tops and outer leaves can guarantee a more nutritious base. Ready to go darker (and healthier) still? While they're not stocked at most salad bars, check the produce aisle for tougher roughage like Swiss chard and kale, which beat out even spinach in the antioxidant game. Be sure to give the leaves a good cold rinse before serving raw, boiled, or steamed, as the folds in these greens tend to accumulate dirt more easily than other veggies. Also keep in mind that high heat can strip veggies of their natural vitamin content. The final key to becoming a lean, green fighting machine? Dress for success. Hold off on the creamy dressings, croutons, bacon bits, and layers of shredded cheese. Instead, opt for a lighter vinaigrette and a sprinkling of chopped walnuts or sunflower seeds for added crunch and protein.